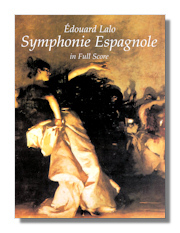 Symphonie Espagñole in Full Score. Edouard Lalo. Dover Publications. 1997. ISBN 048629532X (paperback). Attractive, inexpensive edition of French composer's great composition for violin and orchestra, showcasing virtuoso violin part, as well as Lalo's gifts for magnificent orchestration, clarity of texture, imaginative use of woodwinds and brass fanfares. Reprinted from authoritative edition. Contents. Instrumentation. No separate part for solo. Cello Music by French Composers. Edouard Lalo, with François Couperin, Marin Marais, Louis de Caix d'Hervelois, Jules Massenet, Camille Saint-Saëns, Gabriel Fauré, Claude Debussy, Otto Deri (Editor). G. Schirmer, Inc. 1986. ISBN 0793552230 (paperback). Music for cello & piano by Couperin's La Bandoline, Marais' Two Old Dances, d'Hervelois' La Milanese, Lalo's Chants Russes, Massenet's Melodie, Saint-Saëns' Allegro Appassionata, Fauré's Elegy, Papillon, Apres un Rêve and Debussy's Rêverie & Menuet. Imitation Magnificats for Counter-Reformation Munich. David Crook. Princeton Univ Press. 1994. ISBN 0691036144 (hardcover). After the Mass Ordinary, the Magnificat was the liturgical text most frequently set by Renaissance composers, and Orlando di Lasso's 101 polyphonic settings form the largest and most varied repertory of Magnificats in the history of European music. In the first detailed investigation of this repertory, David Crook focuses on the forty parody or imitation Magnificats, which Lasso based on motets, madrigals, and chansons written by such composers as Josquin and Rore. By examining these Magnificats in their social, historical, and liturgical contexts and in terms of composition theory, Crook opens a new window on the breadth and subtlety of an important composer often harshly judged on his use of preexistent music. The author places Lasso amidst the Counter-Reformation reforms at the Bavarian court where he composed the Magnificats, and where there emerged a fanatical Marian cult that favored this genre. In a section on compositional procedure, Crook explains that Lasso abandoned the traditional eight psalm-tone melodies in his imitation Magnificats, considers the new ways he found to represent the tones, and describes how Lasso's experimentation reflected the complex relationship between mode and tone in Renaissance theory and practice. 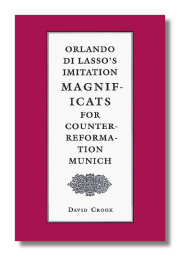 Arguing that Lasso's varied uses of preexistent music defy current definitions of parody technique, Crook, in his final chapter, reveals the imitation Magnificats as vastly more imaginative and innovative than previous characterizations suggest. The Merry Widow. Franz Lehar. Dover Publications. 1983. ISBN 0486245144 (paperback). Ever-popular masterpiece of light opera. Complete Score for Piano & Voice. Reprint from 1907 English translation, published by Chappell & Co., London. Pagliacci in Full Score. Ruggero Leoncavallo. Dover Publications. 1993. ISBN 0486273636 (paperback). Années de Pélerinage, Complete for Piano solo. Franz Liszt. Dover Publications. 1990. ISBN 0486256278 (paperback). Authoritative Russian edition includes: Première Année (Suisse); Deuxième Année (Italie) & its supplement, Venezia e Napoli; Troisième Année & some related pieces, including "Apparitions" & "Lyon" from Album d'un Voyageur. New translation of Russian footnotes & editor's preface. Complete Études For Solo Piano, Volume 1. Franz Liszt, with Ferruccio Busoni (Editor). Dover Publications. 1990. ISBN 0486258157 (paperback). Reprinted from Brietkopf & Härtel edition. Includes the 12 Transcendental Études, the 12 Grandes Études (1837), the Étude in 12 Exercises, Op. 1 (1826) & a separate setting of "Mazeppa." Complete Études for Solo Piano, Volume 2. Franz Liszt, with Busoni, Ferruccio (Editor). Dover Publications. 1990. ISBN 0486258165 (paperback). Reprint of Breitkopf & Härtel edition. Contents include: Paganini Études 1-6; Études d'Exécution Transcendante d'après Paganini. Ab Irato, Three Concert Études, Gnomenreigen, Waldesraushen, Morceau de Salon & Grand Fantasie de Bravoure sur La Clochette de Paganini, Op. 2. Foreword & notes by Busoni. 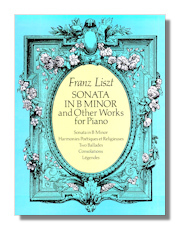 Sonata in B Minor & Other Works For Piano. Franz Liszt. Dover Publications. 1990. ISBN 0486261824 (paperback). 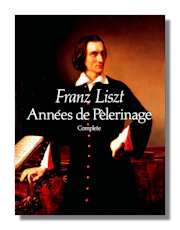 Reprinted from authoritative Franz-Liszt Siiftung edition. Collection includes the Six Consolations; all ten works in the Harmonies po&eacu:tiques et religieuses & the two Légends. the "Sermon to the Birds of St. Francis of Assisi" & "Saint Francis of Paola Walking on the Waves". Complete Hungarian Rhapsodies for Solo Piano. Franz Liszt. Dover Publications. 1984. ISBN 0486247449 (paperback). 19 works including the Rakoczy March. All reproduced directly from an authoritative Russian edition. All headings, footnotes translated to English. Mephisto Waltz & Other Works for Solo Piano. Franz Liszt. Dover Publications. 1994. ISBN 0486281477 (paperback). Selection of works for Piano. Includes: Mephisto Waltz, #1; Rhapsodie Españole; Czárdás Macabre; Liebesträume, #1, 2 & 3; Valse Oubliée #1; Nuages Gris; Polonaises #1 & 2; Fantasie & Fugue on the Theme of BACH; Grand Galop Chromatique; Gretchen (from A Faust Symphony), Valse Impromptu in A flat Major, la Lugubre Gondola I & II; Unstern: Sinistre, Disastro. Beethoven Symphonies #1-5 Transcribed for Solo Piano. Franz Liszt. Dover Publications. 1998. ISBN 0486401146 (paperback). The Schubert Song Transcriptions for Solo Piano, Volume 1. Franz Liszt. Dover Publications. 1996. ISBN 048628865X (paperback). 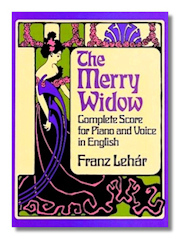 Contains the following songs arranged by Liszt for piano solo: Ave Maria, Erlkönig, Der Wanderer, die junge Nonne, Gretchen am spinnrade, Du bist die Ruh, Frühlingsglaube,: Ständchen, more. Editorial notes & translations of German texts. The Schubert Song Transcriptions for Solo Piano, Volume 2. Franz Liszt. Dover Publications. 1996. ISBN 0486288765 (paperback). Contains Winterreise, Geistliche Lieder, La Rose, Die Forelle & Lob der Thranen. Piano Transcriptions From French & Italian Operas. Franz Liszt. Dover Publications. 1982. ISBN 0486242730 (paperback). Virtuoso transcriptions for piano solo. Included: Sarabande & Chaconne from Almira (Handel); Reminiscences of Don Juan (Mozart); Reminiscences of Robert le Diable (Meyerbeer); Overture to William Tell (Rossini); Reminiscences of Lucia di Lammermoor (Donizetti); Reminiscences of Norma(Bellini); Concert Paraphrases of Rigoletto, Trovatore, & Ernani (Verdi); Waltz from Faust(Gounod); Polonaise from Eugene Onegin (Tchaikovsky); more. Complete Piano Transcriptions From Wagner's Operas. Franz Liszt. Dover Publications. 1982. ISBN 0486241262 (paperback). Contains 15 compositions: Ballad from Der Fliegende Holländer; Overture to Tannhäuser; Bridal Procession from Lohengrin; Liebestod from Tristan und Isolde; Fantasy on Themes from Rienzi; March from Parsifal; Entry of the Guests, Evening Star & Pilgrim's Chorus from Tannhäuser, more. Organ Works. Franz Liszt, with Carl Straube (Editor). Dover Publications. 1996. ISBN 0486290832 (paperback). Fantasy & Fugue on "Ad nos, ad salutarem undam", Prelude & Fugue on B-A-C-H, Evocation à la Chapelle Sixtine, Ora pro nobis, Litani & 11 others. 30 Songs for High Voice & Piano. Franz Liszt. Dover Publications. 1975. ISBN 0486231976 (paperback). Thirty songs for soprano or tenor, with translations of French, German & Italian texts included. Contains Das Veilchen, Der König van Thule, Mignon's lied, Oh! quand je dors, Enfant, si J'é'etais Roi, Der Fischerknabe, Der Alpenjäger, Die Vätergruft, many more. Piano Concertos #1 & 2 with Orchestral Reduction for Second Piano. Franz Liszt. Dover Publications. 1996. ISBN 048629238X (paperback). The Piano Concerti in Full Score. Franz Liszt. Dover Publications. 1986. ISBN 0486252213 (paperback). Piano Concerto #1 in E-Flat Major & piano Concerto #2 in A Major. Unabridged. Les Préludes & Other Symphonic Poems in Full Score. Franz Liszt. Dover Publications. 1994. ISBN 0486283224 (paperback). Includes Les Préludes inspired by a poem by Lamartine; Mazeppa inspired by a poem of Victor Hugo & Héroïde Funèbre.